Sure, we’ve got miles of sandy beaches, and even a former president or two. But did you know that the Maine Beaches region is also a palate-pleasing paradise? Our region boasts everything from James Beard award-winning chefs and restaurants to roadside lobster shacks, and everything in between. We’ve got artisan bakeries, farm-to-fork eateries, luscious ice cream shops – and numerous breweries and distilleries to wash it all down with. And the scenery – well, it just doesn’t get any better. Ocean views, gorgeous architecture, and small New England seaside villages are just some of the views you’ll take in as you treat yourself to some of the most amazing foods, drinks and deserts you’ll ever taste. 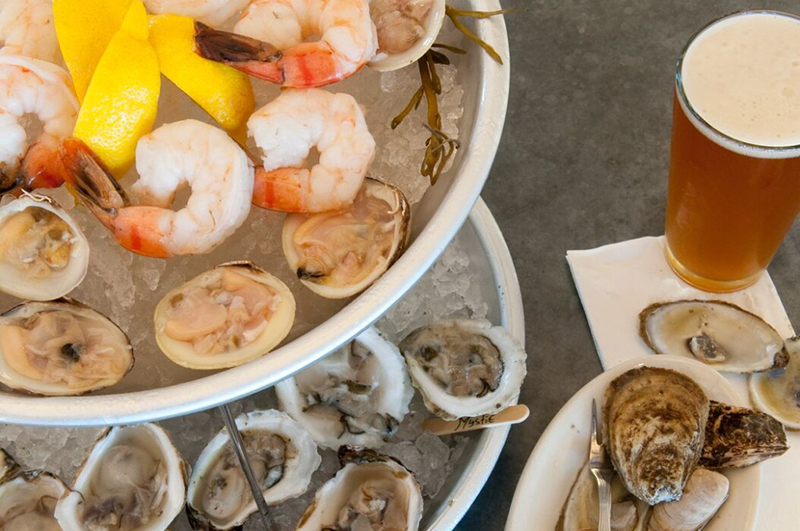 While dining in the Maine Beaches is a signature staple of any visit here, we also have several food oriented events where it’s all about the yum, all of the time. From May 14-20, the inaugural Eat the Kennebunks Week will take place in Kennebunk, Kennebunkport and Arundel. This celebration of all things culinary will include everything from special beer dinners to cocktails classes, prix fixe meals and more. If spicy is your thing, mark your calendar for August 25th, and plan to attend the 18th annual Wells Chili-Fest. This event is sanctioned by the International Chili Society and winners in various categories (Chili, Chili Verde, and Salsa) may qualify to advance to the World Chili Championship Cook-Offs. Love cooking shows and watching all the intricacies of preparing gourmet dishes? Stonewall Kitchen in York offers a number of cooking classes year-round where you can sit ring side while their amazing chefs walk guests through the step by step process for creating culinary masterpieces like Seafood Lasagna and Lemony Buttermilk Chiffon Roll Cake with Blueberry Mascarpone Filling. The best part of this interactive experience? Students get to dine on the results! Also in the Kennebunks, you can enjoy lobster rolls any time you wish by following our Lobster Roll Trail of the Kennebunks. As seen in Coastal Living, the guide lets you try the best the community has to offer. To wash it all down, you’ll definitely want to check out one of our wine or brew tours. Wine Wise Events conducts several guided wine and food walks in the region, and Best Brew Tours out of Kittery will chauffeur you around to several of our local breweries to taste the best beers in the area! While the Maine Beaches is home to many restaurants featuring locally sourced ingredients, we also have several Farmer’s Markets (some seasonal, some year round) where you can find the best fresh produce, meats, dairy, and baked goods. Many of the markets also showcase the works of local artists, including jewelry, paintings, and home wares. Hand made taffy kisses at the Goldenrod (where you can actually watch the candy being made). Fresh warm artisan bread straight out of the oven at When Pigs Fly. The Maine Beaches. Sun. Sea. Scrumptious. ← THE MAINE BEACHES…WHERE BIRDING TAKES FLIGHT!